"that is when my race will begin, not one step earlier." 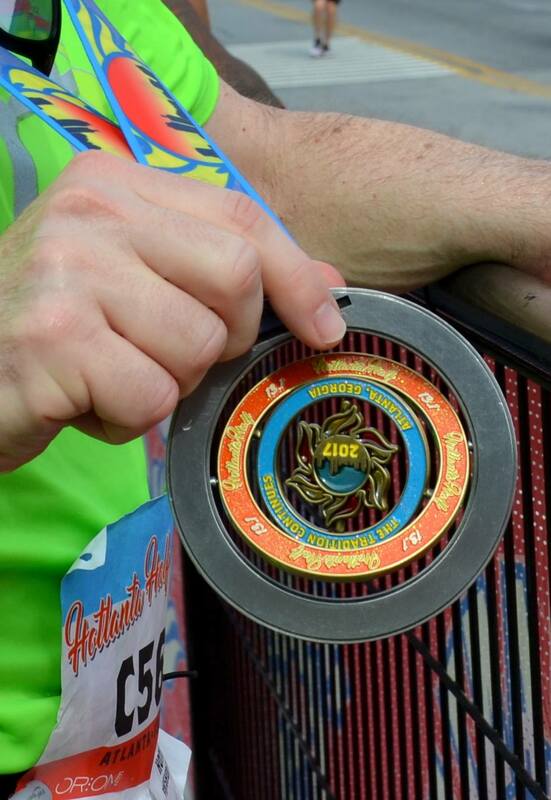 Goals: "My only time goal is to run a negative split race. I'm completely taking the possibility of sub-2 hour finish from my thinking." Tucker Running Club in the house! We had a good turnout from Tucker Running Club this morning. It was nice to see Carl Line, with whom I typically run on Thursday evenings group runs at Big Peach Running Company in Decatur, and to catch up with Thea Pascal, from fall 2016 the marathon training group. 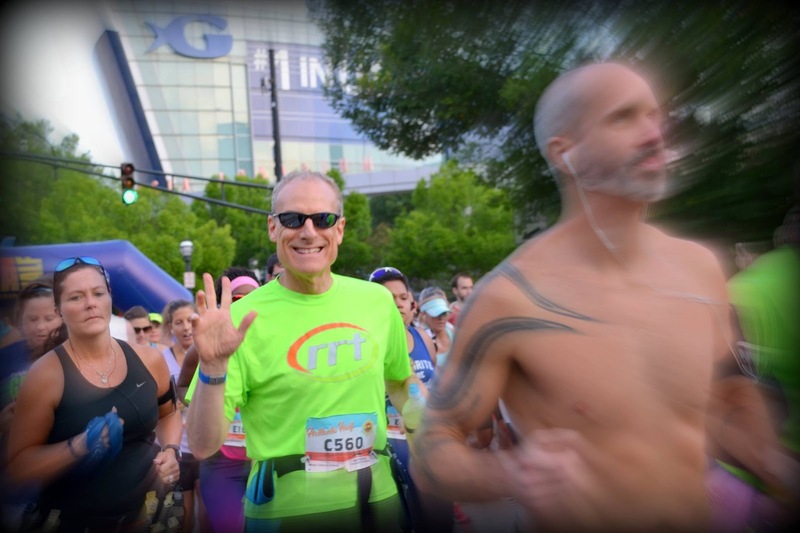 As we lined up for the start, I met Brandi Gilbert for the first time, of the FunnerRunner blog. 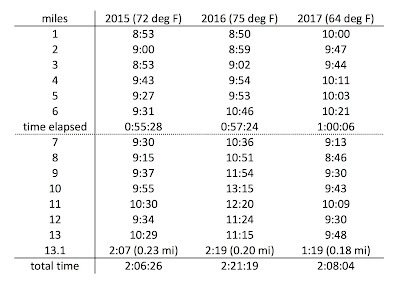 The sky was clear, and according to my Garmin, the temperature at the start was 64 deg F. As in past years, we began precisely at 7:00:00 am, and I crossed the starting line about 40 seconds after the official start. Today's race went very well, almost perfectly according to the plan! I ran the first six miles in 1:00:06, a 10:01 min / mile pace. With the interval strategy, I was "leapfrogging" friends Linda Bode Phinney and Sheelagh O'Malley for the first five miles or so, and it was nice to talk with them from time to time as we were running. The 2:15 pace group , from Big Peach Running Company in Marietta, started in corral B (I was assigned to corral C), but I caught up to them in the first mile. They were running a little faster than the 10:18 min / mile average pace, but one of them told me that they were banking a little time to get through the hills later in the race. In these early miles, I caught up with Carol Parr, also from the fall 2016 marathon training program, and we talked about the Savannah Rock & Roll marathon for a moment. Her advice: make sure you work out parking in advance! I'm trying to decide if I will run a fall marathon, and am considering Savannah. Around mile 3 I had passed the 2:15 pace group for good, still running conservatively. The uphill section in mile 4 slowed me down just a bit, but my self-talk kicked in "Don't worry, you're perfectly on plan, you're feeling much better today than you did last year at this point." Linda, Sheelagh, and I passed Bonnie in front of the State Capitol building, and I was happy to announce to Bonnie "I'm perfectly on plan!" 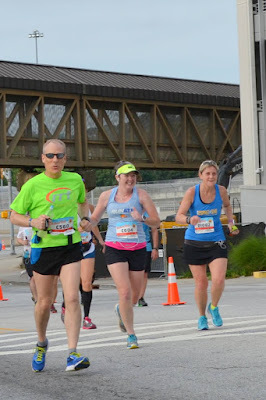 In the middle of mile 6, we ran through an underpass under the I-75/I-85 connector. Running up out of the underpass is always challenging - last year it was where my race began to fall apart - but this year I just took a walk break, stayed calm, stuck with the plan. Beyond this point I pulled ahead of Linda and Sheelagh, but mile 6 was my slowest, at 10:21 minutes, so I was comfortable with my pace. I was on the Beltline! 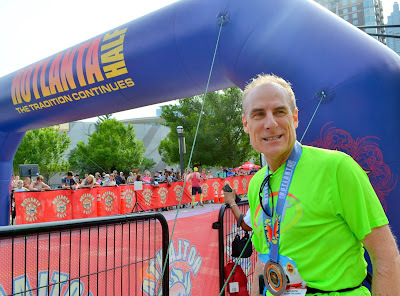 I immediately accelerated, exhilarated by one of my favorite places to run in metro Atlanta. Running north is the downhill direction, about 120 ft steady drop in elevation over 1.9 miles. I passed a LOT of people on the Beltline. 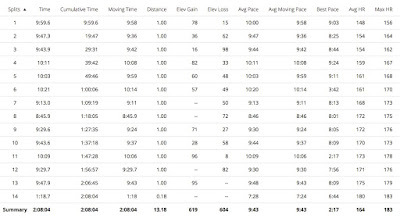 Last year I was already fading by that point; this year I ran the Beltline at an 8:54 min / mile even while maintaining the discipline of the run/walk intervals. I heard someone say as I passed "That guy's gonna burn out on the hills later in the race." 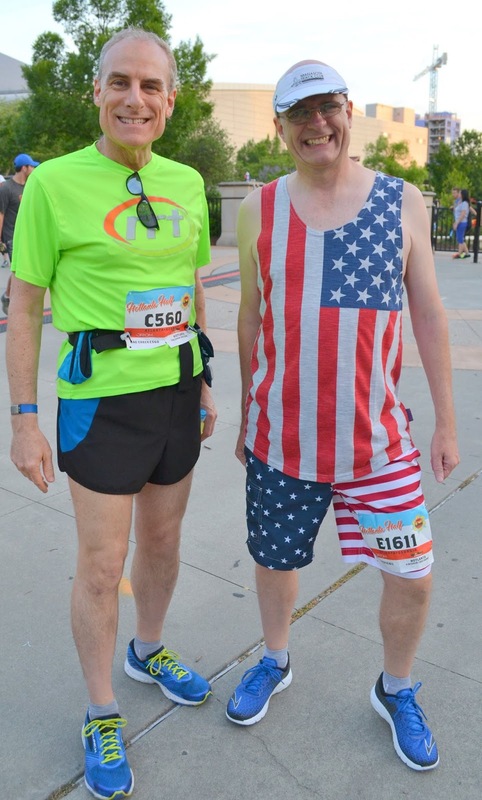 What he didn't know is that I was only running a 7-mile race, with the first 6.3 miles as my warmup. The Atlanta Track Club had a cheering station at the underpass for Freedom Parkway, and I exchanged a quick handshake with Bob Wells as I passed. On the Beltline I caught up to Tucker Running Club member Paula Klingman-Paik. We chatted for a moment, she was having a good race (as was I) but then I pulled ahead. A few minutes later, to my surprise, I caught up to Liz Mann, another Tucker Running Club member. Liz ran this year's Boston Marathon. I just kept going, hoping that I wasn't making a mistake passing Liz, as she typically runs a bit faster than me. In the last half-mile of the Beltline, I passed a runner wearing a shirt in support of Jon Ossoff, a candidate for the special election to fill the 6th Congressional District seat for the U.S. House of Representatives. I slowed for a moment to tell him, "I'm cheering for Ossoff!" Bonnie and I went to a campaign event a couple of months ago, and I was very impressed by Jon Ossoff's progressive but pragmatic message. I've appreciated the positive campaign that he is running. We live just a few blocks outside of the 6th district and can't vote for him, but here's hoping that he wins the election on June 20. Near the end of the Beltline, just past the mile 8 marker, the first cold towel station awaited. I hadn't expected a cold towel station this early in the race, but it was a wonderful surprise! I was working pretty hard at this point, so it felt really good to wipe down my head and face. Still, I felt like I was in control of my race, and was pleased to have found and maintained the higher gear. but it's my pace. Note the increase around 6.3 miles. 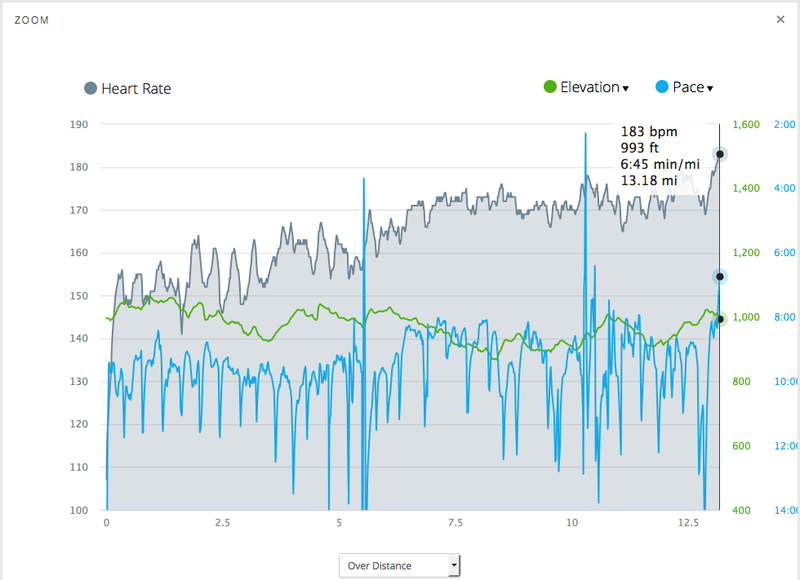 The green trace is elevation, the black is heart rate. I knew that the 9th, 11th, and 13th miles would be tough. Heading uphill on 10th Street along the southern edge of Piedmont Park, I began to struggle and took an extra walk break. 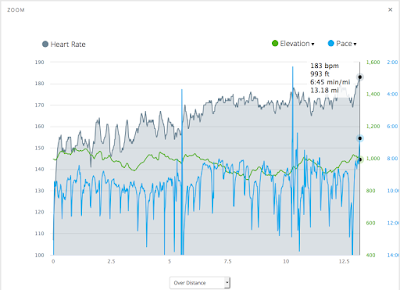 My self-talk remained positive, "You're running a negative split race, you're on plan, you can afford to slow down a bit until you crest the hill." I ran mile 9 in 9:30 (54 feet net uphill), which felt slow after flying down the Beltline, but last year I was completely incapable of running a sub-10 minute mile by this stage, so that was a win! I entered Piedmont Park at the 12th Street gate at 1:28 elapsed for about 9.1 miles. Off to my left I could see the 10-mile marker, but I had to run a loop through the park before I would reach the 10-mile marker. 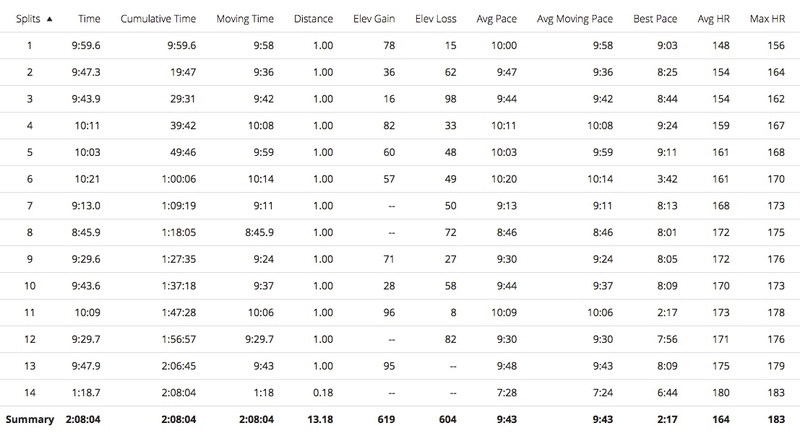 To run a sub-2 hour race, I needed to reach the 10 mile point by 1:30, but I was too far behind to manage that. I reminded myself, my goal today was not the 2-hour finish, my goals were to run a negative split, and to have a better experience than last year, and I was well on my way to achieving both of those goals. It was helpful to know that the 2-hour finish was impossible, made it easier to accept staying on plan. Before long, I had circled through the park and was passing the mile 10 marker, with 1:37 elapsed. I finished the bottle of Nuun, which was the plan, and threw the plastic recyclable bottle into the appropriate bin before leaving the park. I still had 16 oz of water to carry me to the finish, and spritzed a little on my head and the back of my neck. I will admit, at that moment I asked myself "Can I run the last 5K in less than 23 minutes?" Knowing that my PR for the 5K distance is 23:52, in cool weather, and without 10 miles preceding that race, I quickly put aside that ridiculous thought. But what might I run today? Was a 30-minute 5K in the cards, even with two more uphill sections ahead? As I left the park, the most challenging part of the race loomed: "The 12th Street Hill," 60 feet uphill in just two blocks. Checking my watch, I could see that I was on schedule for a walk break in the middle of the hill. I had been carrying the cooling towel for the last two miles, and finally tossed it into a garbage can during the walk interval. It took me 2 full minutes to cover those two blocks, but in the second block, I could hear the cowbells and cheers from the runningnerds, manning the second cold towel station. Beverly Ford was taking photos at the corner, Carol Gsell was announcing my name as I turned onto Juniper Street, Tes Sobomehin Marshall was handing out towels, and they were all cheering as they saw my runningnerds race team shirt! lowering our temperatures with the cooling towels! Heading south on Juniper Street, the road continued to rise in elevation. I knew from last year's race to hold on to the cooling towel until I was close to getting the next towel, although most runners had thrown their towels away (or on the road) within a block of receiving them. My sunglasses were so streaked with salty sweat that I could hardly read the street signs, but I could see 8th Street (three blocks to the turn), then 6th Street, and then the turn onto 5th Street, heading up to Peachtree Street, at the top of a ridge. 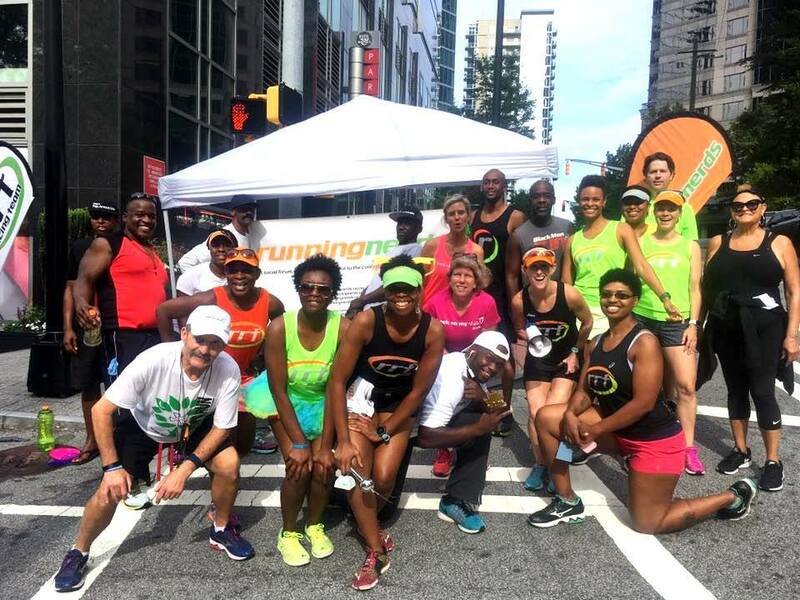 Upon crossing Peachtree Street, I passed the Big Peach Running Company Midtown store, with a few employees cheering us on, and I slowed for a water station just past the mile 11 marker (10:09 minutes, 88 feet net uphill). Heading into the Georgia Tech campus, I knew that much of the next mile would be downhill, and I managed to speed up again. In the middle of campus, I was accelerating into a right turn onto 4th Street. A policeman was telling a driver to "Stop, stop!" but the driver thought that s/he could make it through the intersection before the old dude arrived (that's me). I had to slow down just a bit, but avoided running into the side of the car. The policeman was yelling at the driver, I was none too happy, but fortunately there was no injury and I just kept going. The last water station was just past the mile 12 marker, on the north side of Bobby Dodd stadium. I covered mile 12 in 9:30, 82 feet net downhill, 1:57 elapsed. Just 1.1 miles to go! But now I was feeling tired. I had run 12 great miles, but was questioning if I had left enough in the tank for a strong finish, especially 95 feet net uphill. I took an extra walk break, which helped a bit. Turning onto North Avenue, I began looking ahead for the third cooling towel station, manned by Run Family. A few of their volunteers were encouraging us, and I responded by speeding up as much as I could manage. 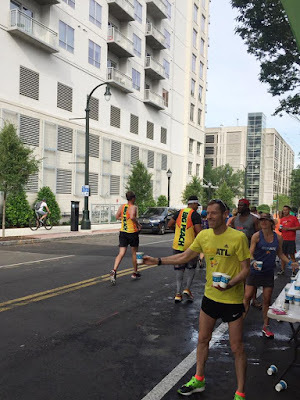 The cooling towel station was quite far down the road (so it seemed), but the volunteers were enthusiastically cheering us on, and I gave them two thumbs up as I accepted a towel and wiped down my head and face. Turning onto Luckie Street at 2:01 elapsed, I had about 7/10 of a mile to the finish. Last year I was staggering down the street, staring through the heat at the prospect of missing a 2:20 finish. Today I was going to do much better. Now my goal was to beat my Memorial Day race time of 2:09, but unfortunately we were still running uphill. I took a couple of short walk breaks as needed. Along Luckie Street, I nearly had a serious mishap: I had been running in the right lane for automobile traffic, which was coned off, but most runners were in a bicycle lane on the far right. I decided to move over to the bicycle lane, and as I crossed a grey line, well, it wasn't a line, it was an inch-high separator. I stumbled a bit, but fortunately I did not fall. Ahh, the danger of running with salt-sweat covered sunglasses. Resolving to be more careful the rest of the way, I stayed in the bicycle lane until we approached Ivan Allen Blvd, when the runners began to move across the road to the left lane, reserved for runners. I carefully stepped over the grey divider - but here it was just a line painted on the road, no separator! Shortly after finishing the race! the three center pieces independently spin! Ivan Allen Blvd was the top of the hill, and it was downhill to the finish. Passing the parking deck for the Georgia Aquarium, the street was shaded from the morning sun. With just 1/4 mile to go, I was determined to accelerate to the strongest possible finish. I saw Cristal Stoutzenberger, working the race as a bike marshal. She recognized me, shouting "Go Frank! You know where the finish line is!" and hit high gear, passing several other runners. Turning the corner onto Baker Street, I expected to immediately see the finish line banner, but it was momentarily hidden until the road turned downhill again for the last couple of hundred feet. I rocketed forward toward the finish line, trying to catch up to a few runners in front of me. Pushing as hard as I could (I actually managed a 6:45 pace for that stretch) I caught up to one of the guys and we hit the timing mat in a photo finish! The clock was just short of 2:09, I threw my arms up in the air in celebration, certain that I had executed the negative split strategy. A volunteer handed me the medal, another volunteer gave me a cooling towel, and I turned into Pemberton Park to cool down. I stopped my watch a few seconds after crossing the finish line, 2:08:04, and felt that I had probably finished just under 2:08, as I had also started my watch a few seconds before crossing the timing mat at the start. My official time was released a few hours later: 2:07:56! 530th out of 1524 finishers, 28th out of 66 finishers in my age group. Miles 1 - 6, 10:01 min / mile pace. Miles 7 and 8, mostly downhill on the Beltline, 8:59 min / mile pace. Miles 9 - 13.1, 9:39 min / mile pace. 64 degrees F at the start, 74 degrees F at the finish. I definitely ran a negative split race today, but it wasn't as huge of a difference as it had felt, only about 3 minutes faster for the second half: from the start to the estimated 6.6 mile midpoint in 1:05:30; 1:02:30 from the midpoint to the finish line. It just goes to show how difficult it is to run the second half of a race faster than the first half. Fortunately I planned and executed the perfect strategy for the first six miles. Although I didn't set a new personal record, I was extremely pleased with my performance. Most importantly, I had a great experience in today's race. I really needed that, after struggling through the Memorial Day Peach Jam on a flat route. 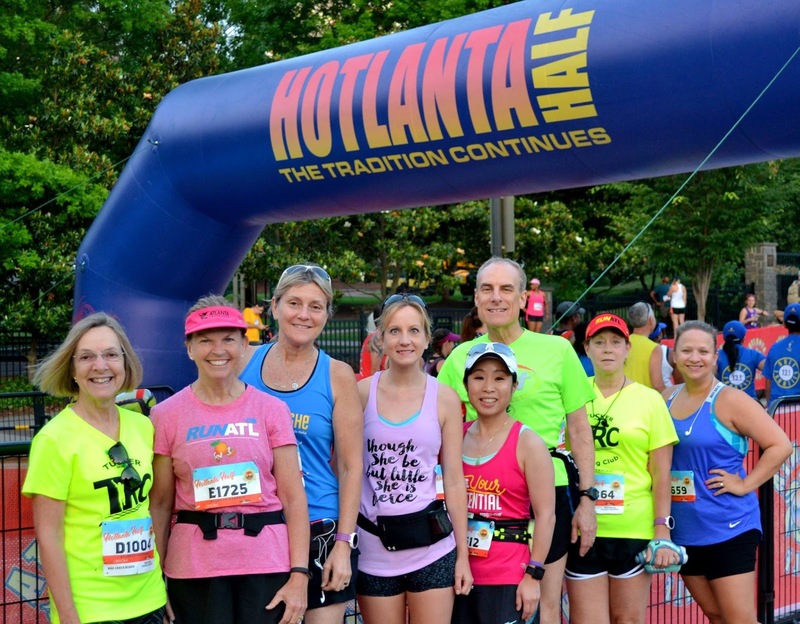 Comparing my Garmin splits for the 2015, 2016, and 2017 Hotlanta races. 2015 was going well until the rain became torrential in mile 10. In 2016, I was struggling as early as mile 4. 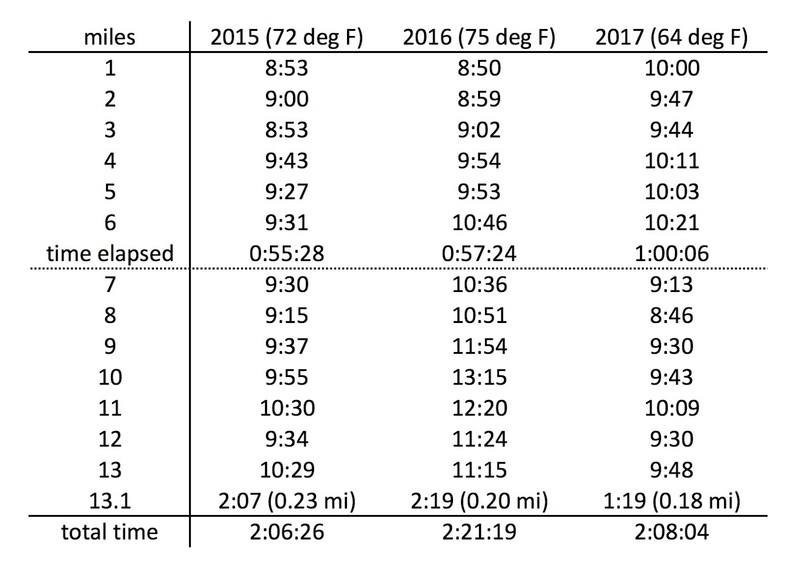 Look at the differences from mile 6 to the finish!